“WANNII PEN WANSONGKRAAN . . .” (วันนี้เป็นวันสงกรานต์…) “Today is the Songkraan Day…” is the first line of the “Ramwongwansongkraan” lyric (เพลงรำวงวันสงกรานต์) which is frequently played during the Songkraan festival. The lyric describes the activities of traditional Songkraan festival starting from the morning through the afternoon. Video Souce from YouTube uploaded by xViStAExteen. 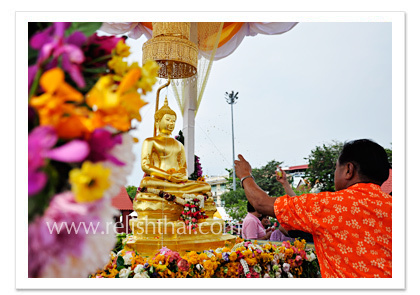 The traditional Thai New Year activities are related more about Buddhism such as going to temples, praying, giving food to monks and pouring water mixed with a Thai fragrance on Buddha images, monks’ hands or elderly people. In the afternoon and evening, it will be an entertainment section. The Sun and time moves into Aries therefore, April is considered to be the hottest month in a year. “Water” (น้ำ) is the symbol for the tropical country like Thailand. People use water not only for relieving the high temperature but also for praying for the rain and good things which can be seen the use of fragrance water “Naam Op” (น้ำอบ) and holy water “Naam Mon” (น้ำมนต์). Songkraan is the time for people to go back home and spend time with their family. It is similar to Christmas in Europe, America and Australia. Today, Songkraan is set to be 13-15 April of every year and it is an official holiday. April 13rd is “Wan Mahaasongkraan” (วันมหาสงกรานต์) which is the day that the Sun must move into Aries and is also considered to be an elderly people day. April 14th is “Wan Nau” (วันเนา). Nau in Khmer language means to stay. It is the day that the Sun stays in its place. April 14th in Thailand is also considered as a family day which people will stop working and spend time with their family. April 15th is “Wan Phayaawan” (วันพญาวัน) or “Wan Thalooengsok” (วันเถลิงศก) which is considered to be the New Year Day. People will wake up early and go to temples. 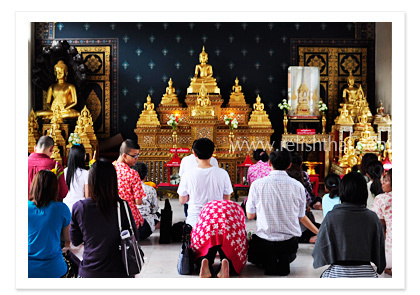 However, today we do not see many religious activities in the big city, there are still the activities in rural area.